Turnkey environmental charity initiative for your company. 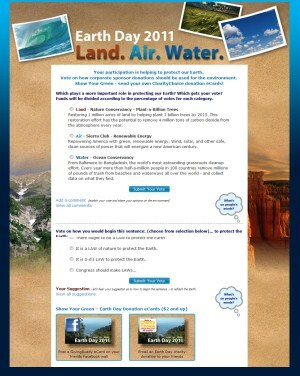 Corporate sponsors can create their own customized Earth Day Campaign, featuring charity affinity for green causes. Corporate donations for green, environmental charities. Personalized donation eCard gifts by email or delivered via Facebook to your friend’s wall. $1000 minimum donation; either in donation eCard purchases or funds to be divided according to visitor vote. Vote for the environmental cause that you feel is most compelling. Vote for who you feel is most responsible for protecting our Earth. Send Green eCards and post on Facebook Wall or Twitter. Make this Earth Day 2011 the most meaningful, by contributing towards green causes who help preserve the environment. CharityChoice GivingBuddy eCards for $2 and up.